skipandscatter: Loving the Place We Live - Montreal Edition! Loving the Place We Live - Montreal Edition! Is it spring where you live yet? It has officially arrived here in Montreal. And I can tell that not because the weather is gorgeous or because we have taken our bikes out for the first time today... I can tell that spring is here because Montreal has spilled out onto the streets. Seriously. Today felt like every last person in this city came out to bask in the sunshine and ridiculously warm weather (22 degrees!). The cafés opened their outdoor terraces, the streets and balconies were full of happy people, and the line-ups at the ice cream shops were unbelievable. And it all kept me smiling all day long. Remember how Gabrielle from Design Mom has started posting Love the Place You Live reports for people to share their little corners of the world? I decided to share some pictures from our first bike excursion to the market this season. Jean-Talon is one of the biggest and liveliest farmer's markets in the Montreal area. It is situated in the Little Italy district, a bustling part of town chock-full of tiny family groceries and cosy little cafés, locals and tourists, retirees tending to their tomato plants and street musicians strumming their guitars. 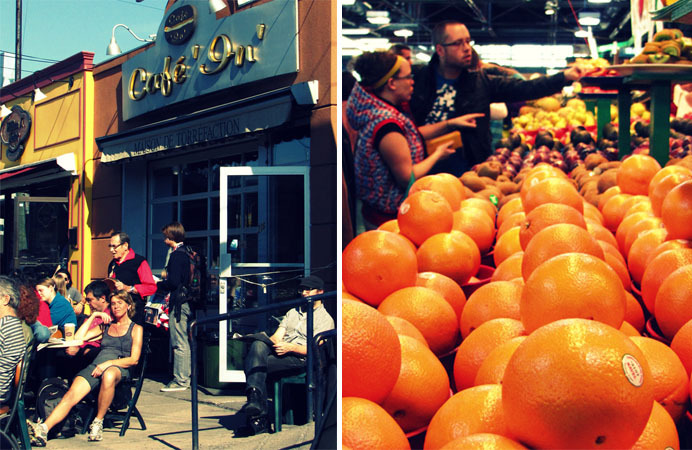 On weekends, Jean-Talon attracts quite a crowd. 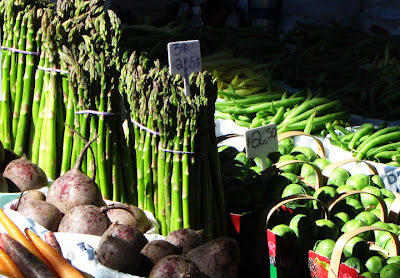 There are those who are there to shop for fresh produce and those looking to snap that perfect market picture. There are the café-dwellers and the people-watchers. There are couples and families, farmers and grocers. There is a lot of laughing, sampling, shouting, gaping and stepping on people's feet going on. 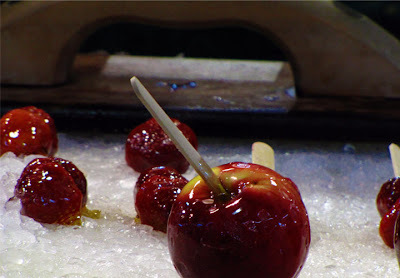 It is almost impossible to leave without armfuls of irresistible fruits and vegetables. And then trying to fit it all into your bikes' baskets. Although the outdoor stalls are not open yet, there was a nice warm spring breeze going through the roofed market pavilion today. The atmosphere was electrifying! Outside, the maple syrup vendors set up shop. 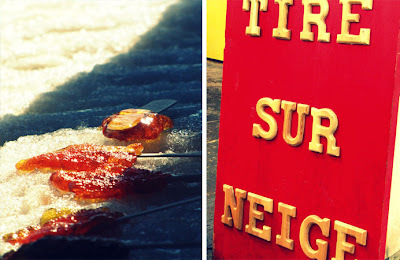 They were selling tire sur la neige - maple taffy made by pouring hot maple syrup over snow. Pure goodness, I tell you! Jean-Talon market is definitely one of my favourite places to be in Montreal. It holds much of the essence of this city and of its people: love of good food, loud laughter, and more nationalities coming together than you can count. There are no guided tours or majestic views, but there is life, the kind of life that makes Montreal such a beautiful place to live - especially in this kind of weather! What about you? Ever been to Montreal? Or have a favourite place of your own you would like to share? You know we want to know!